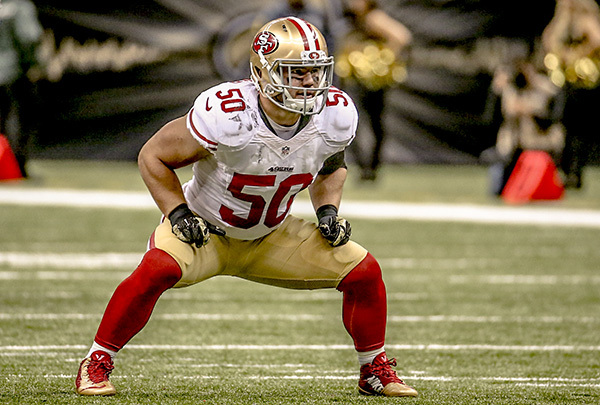 Chris Borland retired today citing concussion concerns and the desire to “live a long healthy life.” He’s 24. He’s had two diagnosed concussions in his lifetime — the last one came when he was just a sophomore in high school — but he feared he might have gotten rung in training camp last summer, which seems like a totally valid fear. He’s 5’11, less than 250 pounds and has been a theoretical underdog his entire career. It’s not a stretch to assume he’s been hit very hard an absurd number of times. The state of the Niners recently-vaunted linebacking core — he had the unenviable task of filling the ludicrously large shoes left by recently-retired Niner legend Patrick Willis — is now in total flux, but that seems like an afterthought. A 24-year-old inside linebacker has just retired from the game of football, voluntarily. It came just a few months after he racked up a team-high 103 tackles. Those 103 tackles just happened to come in his rookie season. So yeah, to reiterate, a 24-year-old (ostensibly) healthy inside linebacker weighed the very real cost of playing football at professional level against a normal life he wished to have, and the normal life tipped the scale so violently that his career catapulted out of sight. deGrasse Tyson is pretty much the smartest dude on the planet. If I were Borland, I’d be scared shitless too. Just think about this: In one game last season, Borland recorded 22 tackles. 15 miles per hour is an incredibly attainable speed. He is 250 pounds. That means that a healthy percentage of his tackles in a single game harbored the same kinetic energy as a war machine, which is admittedly scary. Players have called it quits before. They’ve done it with fewer health concerns and less imposing physical odds. Barry Sanders retired about a season shy of Walter Payton’s all-time rushing record without super specific reason. Jim Brown left early too. Just this off-season, three other 30-and-under players, Willis, Jake Locker and Steelers linebacker Jason Worilds, have retired from the game. But Borland is the only player ever to preemptively retire from the game of football due to concussion concerns. He says the decision is final, and that’s kind of cool. He has said he wants to go back to school (he studied history at Wisconsin) and potentially go into sports management, which seems like a good field for a former athlete1. ESPN will undoubtedly first cover the on-field implications for the 49ers, and that’s understandable, but this feels bigger than a guy getting scared for his future sanity. This is a guy forgoing $2 million over the next three years out of fear. That’s crazy. Not many guys would turn down that type of money to do anything, especially play a game that most people seem to really enjoy. But not a lot of guys would weigh the consequences of their actions in such a critical fashion either. So given the particularly, say, impassioned state of most athletes, fans and other immediate sports family members, Borland’s retirement probably won’t be a harbinger for things to come. But for the next player who has any reservations — and there will be more — he won’t have to cite a suicidal former player as a cautionary tale. He’ll be able to point to a guy who made his own decision to leave a game that had been both wonderful and terrible to him. And he’ll probably be just fine for it.